This has been such a hectic week and I feel like I've barely had a minute to breathe. The weekend couldn't come sooner, plus its a three-day weekend which makes it that much better. Today I already broke my resolution by wearing stripes, but I paired it with a pretty sweater that has mismatched buttons to spice it up. The tee shirt underneath was inspired by Amanda's most recent look. It sort of reminds me of the late 90's, probably because I always wore baby tee's under tank tops since I was a tween (not that they had that term then). Oh man, remember G&G, or when Topshop was still affordable? G&G was this awful store in the mall that was like Forever 21's slutty little sister. I'll never forget in 1999 Topshop blew my 12 year old mind because I was able to buy a really fab black moto jacket and a baseball tee with a mouse on it with my own money. Plus it made me seem cool to have clothes from London when most kids had never left the country yet. Speaking of leaving the country, I have some plans that I'll share with you soon! Anyway...the 90's. Yeah! I'm gonna listen to some Gin Blossoms and work on that GeoCities site...ha. Goodnight kids. 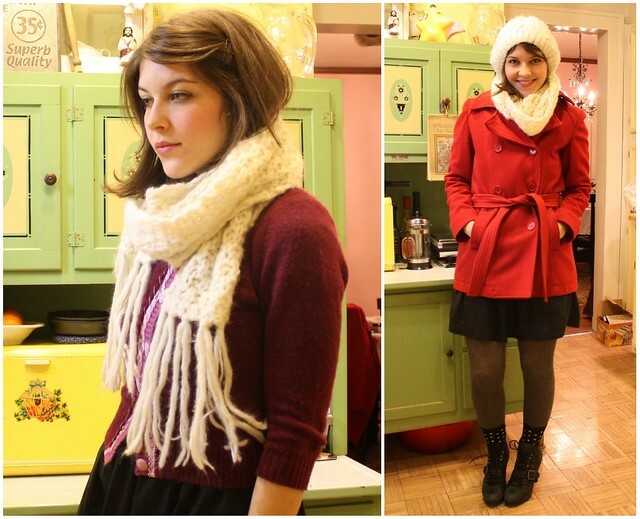 This is such a cute series of looks - and I love your red jacket. I hope you have a really relaxing weekend. you are so cute. i like the last one the best. i miss gin blossoms. omg. i totally remember G and G! hahaha! flash back! you couldn't have described it better! thanks for that. and i miss hole. and smashing pumpkins. I adore this look! The stripes look perfect so don't worry about that resolution! ;) Ohhh It was a sad day when Geocities was no more, that was pretty much my teen years right there! cute outfits...I'm so excited for the 3 day weekend. School started this week for me and I'm ready to have a little bit of relaxation. Is that your kitchen? So cute!!!!!!!! I love the macth with red and withe!!!! and the dress is lovely! Love your little red jacket! You look fabulous, of course. 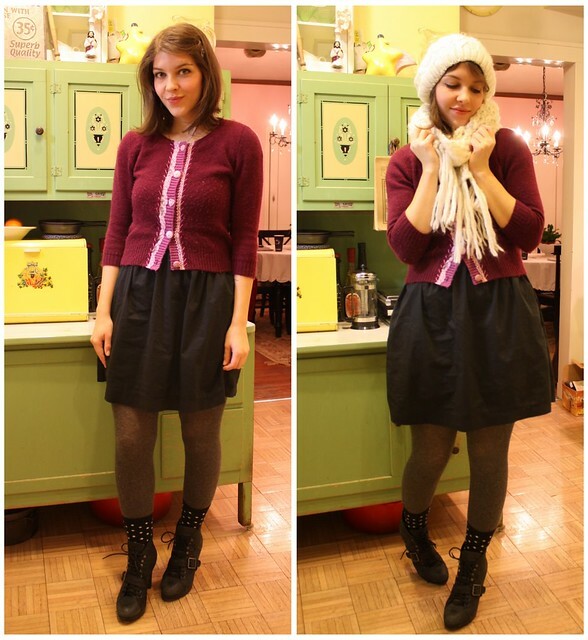 My favorite part of the outfit are the cute socks peeking out with white dots adding a dash of surprise. Oh, and one more thing... I love your cabinets! So playful and saturated with color. Love your outfits! You have such great style. Oh man, geocities. :) I spent the 90s writing angst ridden websites. i do get the nineties vibe from this! this whole get-up would look really cute with lace up boots, too (and maybe even more 90's?). and to answer your question - nope, i didn't go to penn state. i actually went to temple. however, my best friend (jennifer way) went to penn state and i visited her up there all the time. I just need to say: cutest cabinets EVER. also, is that your kitchen?!?! It's adorable!!! I want to see more pictures! just found your blog. so cute!